This camper required a lot of restoration by the owners. This is a Loge Mobile cab over, slide in, fiberglass shell camper. These campers were manufactured in France. LogeMobile manufactured campers for a long perior of time. They had an excellent reputation by took a financial hit and had to close their doors. RB Mobile took over operation and builds models that are the same names as the LogeMobile originals, i.e. ‘Mangue’ and ‘Dynamis’. Sadly RB Mobile’s attempt to maintain production has been short-lived. They also ceased production of these campers on 2013. Repairs to the camper began with sealing the exterior shell by painting it white. On the interior there were need repairs to the bathroom where everything needed to be replaced. This included the sink, toilet, and shower. A small cabinets was added under the sink. 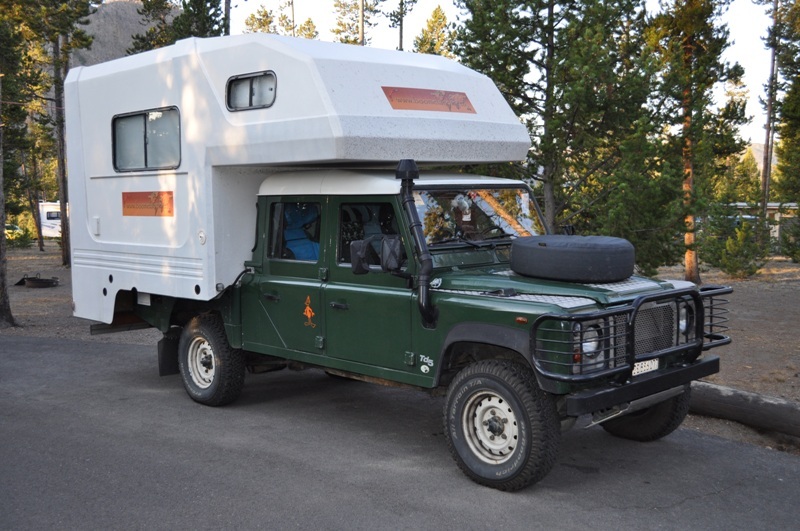 The owners of this adventure vehicle worked hard and were very satisfied with the final result. 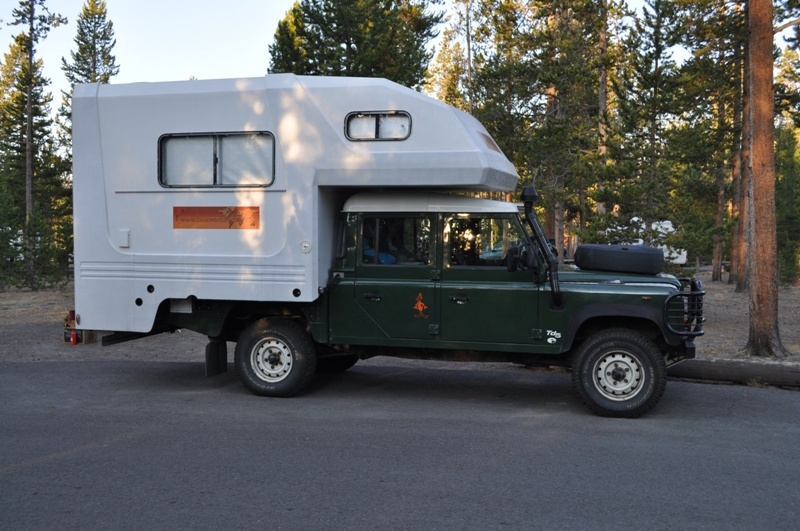 After all the repairs and upgrades were complete the camper needed to mounted to the Land Rover chassis. The height needed to be reduced therefore a portion of the floor was cut out. it was replaced with a reinforced plate that was installed on the camper sub-frame. The fridge needed to be replaced as well as the entire electrical. A hatch was fabricated to access the dump, install the gas. The camper has a 55 liter water tank. The vehicle of choice is a double cab Land Rover Defender TD5 130 4×4 pick up truck. The Defender is powered by a 2.5-litre, five-cylinder in-line turbodiesel engine, badged the Td5. The The engine uses electronic control systems and produced 122 hp at 4850 rpm. Not only did the camper need some restoration, there was some additional work on the vehicle as well. One of the first modifications was the installation of shield plates and cover to accommodate the camper. A frame was also build inside the bed. With the additional weight of the camper the rear shock absorbers and springs needed to be upgraded. For that expedition look a air intake snorkel was added. On the front a wheel relief was added for the spare tire. Looks a bit heavy in the rear, but then again a Defender 130 is really heavy-duty.